If you're looking for perfect newborn toys, this amazing grow-with-me Play Mat for Baby is the right choice. 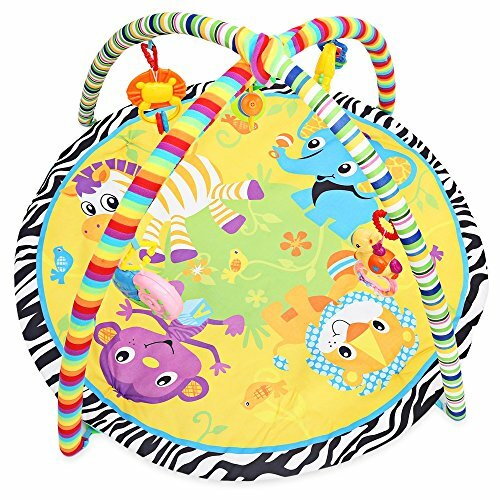 ●Our thick baby play mat is durable and easy to clean. ●Thoughtfully designed to promote cognitive, visual, and motor development from newborn to toddler. ●The pendant hanging on the frame will rustle and exercise your baby's hearing. ●Organic accessories, sustainably harvested wood. Water-based non-toxic finishes. ●Can help you enhance your infant's development and make it fun! 【Playing and learning】While playing on Baby Gym, your child makes more discoveries every single day, and his basic skills continue to become stronger. By kicking the keys, your child can do stretching exercises which enhance her flexibility and motor skills. 【Develop hearing and visual abilities】This gym toy is made of bright, engaging colors.help develop your baby's sense of visual abilities.Create sounds by kicking things, and develop children's hearing ability. 【Creativity playmat design】With a super soft base protects children's safety, plus a variety of hanging toys, playmat is the ideal companion for tummy time. This gym toy is made of bright, engaging colors. 【Baby toys that grow with your child】our Large Baby Gym has 4 different modes of play: Lay and Play, Tummy Time Play, Sit and Play, and Kick and Play. This Play Mat for Baby is suitable for age 0 up to 36 months and designed to grow with your child. 【Best baby gift】A distinct and an elegant gift idea for a range of celebrations including Christmas, christenings, baby showers and presents for the family. The perfect present for a baby shower or expectant mothers, it is a go to newborn gift for any special occasion. Compact, it twists and folds flat for easy storage.